Industrial Sensors Training coming to Houston! Learn about photoelectric sensors, proximity sensors, limit switches, measurement sensors and more. You will even learn about how vision sensors and systems can help your efficiency and QC. HANDS-ON learning for the applications in your facility. How can using the proper sensors correctly help you and your line? This is where you’ll learn. Be the SENSOR EXPERT at your facility. 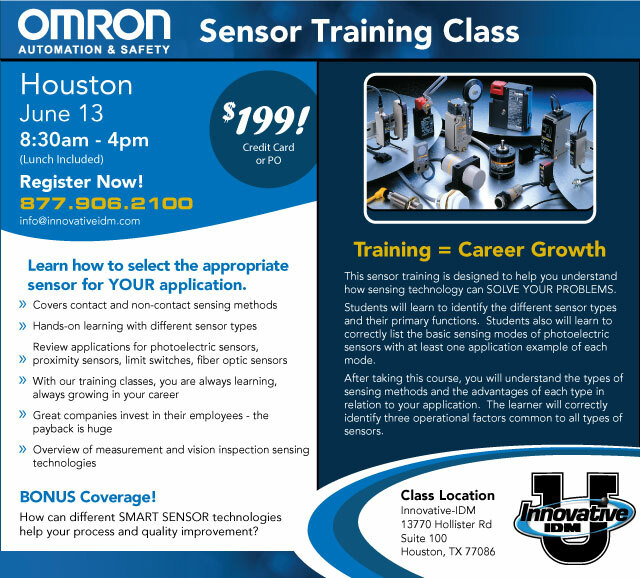 Register today for the Houston Omron Sensors training class – contact us at marketing@iidm.com or give us a call at 877.906.2100. View our full 2013 training schedule on our training website. Omron E3S-R Transparent Object Detection Photoelectric Sensors will be discontinued in March 2014. Recommended replacement for these Sensors is the E3Z-B or E3ZM-B. Click here for more details and a list of affected parts and their recommended replacements.